Activities to practise weather vocabulary: a crossword, labelling and finding opposites. 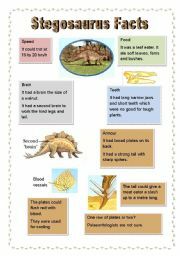 A simplified reading about the Stegosaurus to suit elementary to low intermediate students. Exercises include multiple choice questions, matching words and meanings and answering questions, where simple answers or full sentences may be given. Editable. Answer Key with full sentences included. 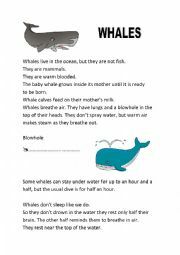 A reading about whales, followed by some exercises on the information. There is also a link to a short video with an example of whalesong. Fully editable. Includes answers. Beginner to low intermediate level. 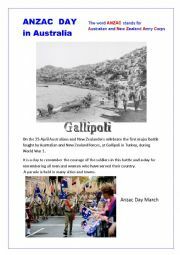 A short informational reading about Anzac Day and how it is celebrated each year in Australia on 25th April. It includes a recipe for Anzac biscuits - Delicious! A fill the gap activity to revise question words and prepositions, and match the word to the meaning. Fully editable. Answer Key included. News Report: The World�s oldest dog? 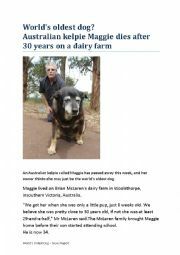 A news report about the death of what is possibly the world�s oldest dog. The article has been simplified for students. 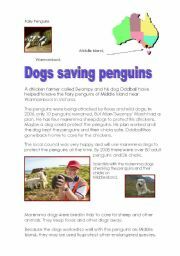 Includes a vocabulary exercise and questions to answer about the article. 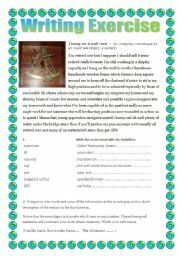 It will assist in broadening a student�s vocabulary with phrases such as �passed away� , �to put an animal down.� Includes answer key. Fully editable. 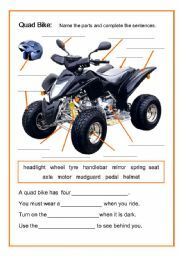 Label the parts of the bike using the list of words given, then complete the sentences with some of these words. 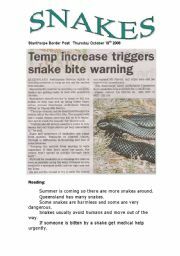 An interesting news article. The easy reading is followed by comprehension questions, a wordsearch, a crossword and some jumbled sentences to put in the correct order. A short reading written in the first person in the form of a monologue. Lots of interesting vocabulary then an exercise to check comprehension of words followed by a writing exercise. This could be used by advanced students to practise their writing skills. Answer Key included. Fully editable. Am/is/are exercises. Practise using the verb to be in statements and questions.